5 In. Innerspring Mattress; ball bearing rollers; Polypropylene support deck, and automatic leg opening. Available in 30 In., 39 In. and 48 In. Wide. The Length is approx. 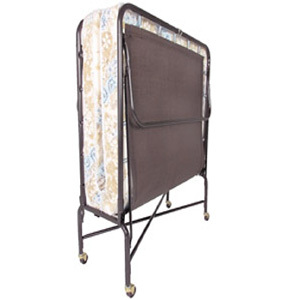 75 In..
* Poly deck support surface will not rust and provides total coverage support for the mattress. * Extremely mobile with Lite Touch Casters. * Sturdy tubular frame is strong, lightweight and easy to handle. * Crossed Center Support enhances strength and durability. * Fast Setup leg automatically lowers as unit is opened. • Mattress and Cover is FIRE RETARDANT - Tested meeting USA and California Laws. 425P - 2/6 30 In.